Hair follicles normally go through a growth cycle of three stages: anagen (growth) phase; catagen (transition) phase; and telogen (dormant) phase. The anagen phase normally lasts several years, and is the time when the follicle produces a hair. The hair continues to grow until some unknown signal causes the follicle to enter the catagen phase. The catagen phase lasts a few weeks and marks the end of the growth of a hair. The follicle begins to shrink. At the end of the catagen phase, the hair detaches from the follicle and may easily fall out, and the follicle becomes dormant. The telogen phase is when the follicle is dormant. It lasts about three months. At the end of the telogen phase, the follicle leaves the dormant state and re-awakens, ready to grow a new hair. If the old hair has not already fallen out, it is pushed out by the new hair. Then the follicle enters the anagen phase once more. In men with male pattern hair loss, the follicles on the top and front of the scalp are genetically pre-programmed to be sensitive to the hormone Dihydrotestosterone (DHT). When these follicles are affected this way, they no longer go through the normal growth cycle. The duration of the anagen (or growth) phase becomes progressively shorter, and this results in the hair from an affected follicle becoming thin and short. Ultimately, the follicle will enter the telogen phase but will not re-awaken. The follicles at the sides and back of the scalp are not affected by DHT, and their growth cycle continues as normal. When a hair transplant is performed by a skilled hair transplant doctor, hair follicles are selected from the sides or back of the scalp for transplantation. These are the follicles that are not pre-programmed to be affected by DHT. These hairs are usually cut and the follicles are carefully placed in small follicular units into tiny incisions in the balding area. After these hair follicles have been transplanted to the balding area of the scalp, they will “awaken” and then continue their normal growth cycle. The transplanted hair will grow naturally, indistinguishable from the hair of the unaffected areas of the scalp. The result is permanent and completely natural-looking hair that follows the normal hair growth cycle. 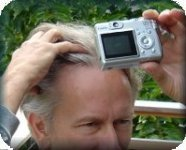 This entry was posted in Baldness, Genetics, Hair Health, Hair Loss, Hair Problems, Hair Transplant, Hair Transplants on January 8, 2010 by Larry Shapiro.